Vault Rooms are a very good tool to have as a last resort shelter in order to keep your family safe. A secured vault room is most often used as a sanctuary for your most valued property. Most vault rooms are made of thick concrete walls with a very secure vault door. You will want your vault room to be extremely sturdy and well-designed in order to protect you from the power of nature or the evils of man. Many people build a vault room as a last resort against tornadoes or hurricanes, depending on where you live. Where I live it is tornadoes we need to worry about. Vault rooms can be equipped with a vault door that is beautiful stainless steel, or painted with a high gloss paint job. Vault doors can also be very basic unpainted metal to save money. Some people do not want their vault room to be obviously visible so they camouflage the door by adding fake walls that the untrained eye would never notice. There are many things you must consider when setting up a secured vault room. Vault rooms are the shelter of last resort and may need to be occupied by your family for an extended period of time. If someone breaks in and you need to flee into the vault room then you will need to have plenty of food and water. It would be wise to stock your vault room with plenty of foods and gallons of drinkable water. You will need a hardwired phone line so you can call the police in a scenario where you cannot grab your cell phone before seeking shelter in the vault room. A first aid kit that is equipped with all basic first aid items is good to have. Be sure to include any medications that you or family members need on a daily basis. The concrete walls are nearly impossible to break through so the vault door could be the weak point if not properly equipped. We offer many types of vault doors for all different levels of security. The different types of locks we offer include biometric locks that can help you get into the vault room quickly and without a key. We offer many options that can make it almost impossible to cut into the vault door and offer your family and valuable property an extreme level of protection. Please feel free to call me to discuss how Smith Security Safes can provide you with a vault door that will best suit your needs. 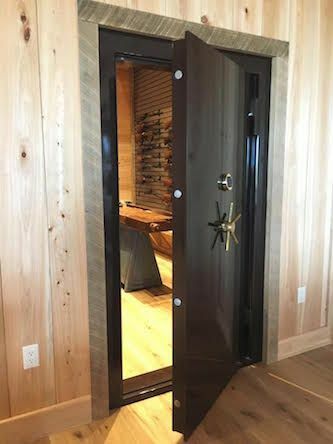 Smith Security Safes designs custom walk-through vault doors to disguise vault rooms. Stainless Steel Laminate on a Black frame with Gold Lock and a 5 spoke USA handle. As you can see it is in a rustic siting with a unique way to conceal it. Key Vault Room Benefits: The convenience of an office with the security of a concrete vault room. Vault Rooms can be used as a storm shelter and a shelter against intruders. Vault rooms are designed to meet your needs and specifications. A vault room can be designed to meet your specifications, in fact we will send a representative from our factory to design and construct your vault room. Just call, we want you to feel comfortable making your purchase with us. Why do I need a vault room? Almost everyone was told the story of the three little pigs as a child. It is the introduction to the fact that some people are not good and only want to do harm, and you need to be prepared for these people. In general, people have a few concerns that have to be addressed before they can feel secure. Food, water, and shelter are the three big ones that need to be secured before people can feel at peace. As we have advanced, we have established abundance of food and water and we have been able to develop much better forms of shelter. There have always been two groups of people, the makers and the takers. Makers are people who work hard for what they have and respect another people’s property. The takers are people who do not respect property rights and only want to advance themselves. In the old days, kings were the only ones with any real wealth worth protecting, but now anyone can accumulate wealth. These days, we can all have our own metaphorical castle walls, and better yet, our walls can be hidden so the takers don’t have an indicator that there is anything to steal. Many of us have accumulated wealth or valuable assets that others envy and want for themselves. A vault room is one of the best ways for a person to virtually guarantee that their property cannot be taken by anyone. Thick concrete walls paired with a steel vault door created based on your requirements are what I recommend if you need to keep your most valuable property just that: your property. Vault doors and vault rooms are a great advancement in the area of shelter. For a reasonable price anyone can create a shelter of last resort for their loved ones or their own personal bank vault for whatever you need to keep away from the hands of the takers. Even if you live in a safe area with a relatively low crime rate, a vault room can provide that extra peace of mind. Vault rooms can be regulated for humidity and temperature easily to preserve your antiques or other degradable items in good condition. Perhaps you already have a safe or multiple safes, but want to consolidate your property into one ultra secure place then a vault room with one of my vault doors could be a great option for you. The economy is relatively good right now, but the next crash could be right around the corner. This could cause a run on the banks and you may not be able to get your money out of the bank quickly. It is a good idea to hedge against that risk by having items of intrinsic value such as cash, gold, guns, food, and /or water hidden on your property at the ready to trade with and sustain your loved ones.